In the meantime, a newly-launched platform called Twtrland wants to give you a simple way to figure out whether or not you should follow, along with a new way to search the Twitter graph. The company has been around for over a year now, slowly building a database of Twitter info to deepen profiles and start building out social discovery features. Today, the site’s presentation is much improved as is the ease of use. Going forward, the founders plan to focus on expanding networks and adding more nuanced search. The free-to-use platform is pretty straightforward. The site essentially pulls together all the info they can find on individual users in the Twitterverse and creates a profile for them that’s broken down into behavior patterns, famous words, top followers, links, replies, pictures and check-ins. As you see if you search for your own profile, at the top you’ll find your tweets-per-day average, along with the average number of re-tweets and replies you receive per-100-tweets. Next to that, there’s a pie chart that offers a breakdown of how often your tweets are pure text, re-tweets, include links, are replies, and so on. 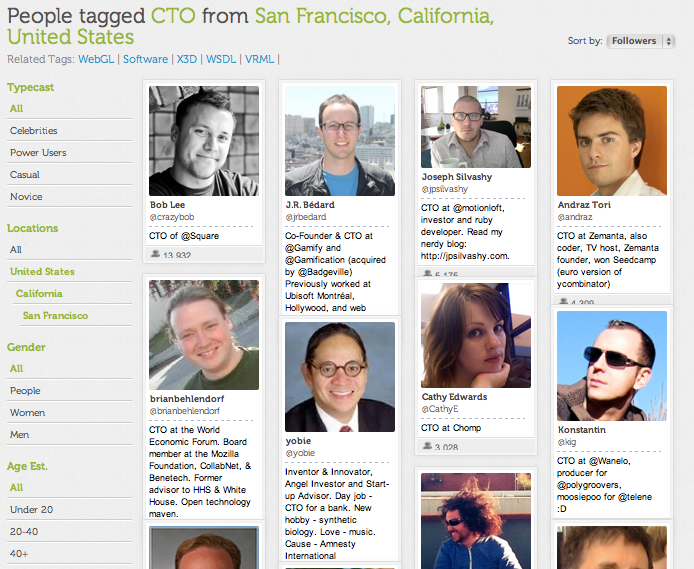 Search for a person and you get a Pinterest-like cascade of results. That’s fine, but what’s more useful is the tree of context that you can find within a few clicks of your profile. If you want to know how many top Twitter users from Canada follow you or how many 20 to 40 year-old celebrities follow you? 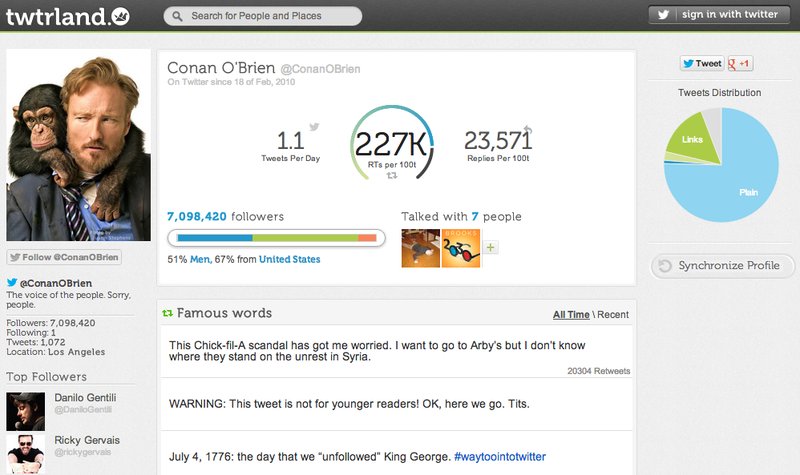 Twtrland allows you to break down each category and dive into that data. As to how it will monetize? Expect to see premium profiles as part of the startup’s future equation. The site also offers a good way to get a sense of who’s following your business, who follows celebrities or figures in the media you admire. All in all, it’s a useful complement to other Twitter analytics tools and one of the deeper ways to get an overview of the people and places worth following in TwitterTown — and it doesn’t even come with a Klout score.